2 oz. Sterileware® Scoop 1" x 3" x 1-1/2 " Bowl; Overall 8" L | U.S. 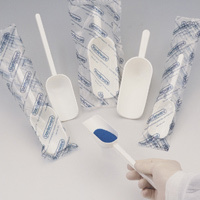 Plastic Corp.
Sampling scoops are the perfect shape and size for taking samples, especially from wide-mouth containers. Designed to hold various capacities, the one-piece scoop is molded of white high impact polystyrene, and each is individually sterilized and sealed in a polyethylene bag. The smaller 2oz. and 4oz. sampling scoops have been improved with a longer handle that increases the distance between the hand and sample. These scoops have also been re-designed to remain upright when filled or empty allowing them to be used as weighing boats or to be placed on a flat surface. Packed ready for one time and disposal. 100 individually sterile wrapped per box.